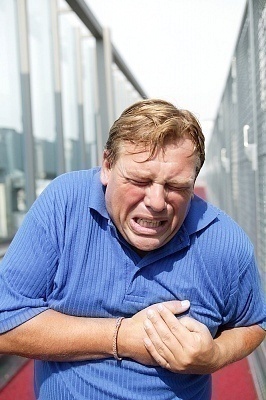 Compared to pain at the right side of the chest, left side of chest pain is more dangerous because it is connected closely to fatal heart conditions. When this type of pain is felt, there is a possibility for the patient to have a heart attack. If this is not the case, other possible reasons include heartburn and acid reflux. For people suffering from this kind of medical condition, it is best to know its symptoms, causes, treatments and diagnosis. When suffering from this type of pain, people usually experience paleness of the skin. In some cases, it causes sharp pain to the upper, lower, left and right parts of the left chest area. Meanwhile, some patients vomit due to the dull feeling, shooting pain and tingling sensation associated with this type of chronic condition. Furthermore, they can also feel some tightness in the chest, breathlessness as well as stabbing pain. Other signs of pain in the left side of the chest area are excessive sweating and palpitation, which are somehow connected to severe pain. More importantly, it is highly important to take note of various symptoms like anxiety, palpitations and rapid heart beat because they are visible signs that people are bound to have a heart attack. There are three major reasons why people experience pain in the left side of the chest, namely heartburn, acidity as well as heart attack. When there is a buildup of gas in the stomach and intestines, patients can experience shooting pain and breathlessness because there is pressure on the chest wall. Other possible causes of pain in the left side of the chest area are pneumonia, mitral valve prolapsed and pericarditis. This type of pain may also indicate pulmonary embolism, aortic dissection as well as angina. 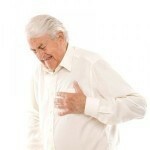 In case of a possible heart attack, it is good for the patient to undergo a series of medical examinations and tests. After checking the symptoms, the doctor must put the patient under electrocardiogram to determine if there are narrowed or blocked heart vessels. There is also a need to measure the enzymes that the heart muscle cells produce. Other diagnostic tests for this type of pain are transesophageal echocardiography, CT scan and chest x-ray. 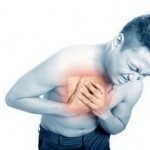 If the pain is caused by angina, patients must take nitroglycerin tablets to be relieved from pain. In case of acid reflux, they can kiss the pain goodbye by taking antacids. If the signs show a possible heart attack, call medical emergency services right away. While waiting for the ambulance, the patient can take a couple of baby aspirins.